Why you SHOULD go to Paris in August – Writer. Traveler. Tea Drinker. If you are like me and planning a trip to Paris in August you might feel pretty dejected. The constant advice you will hear from source after source is DO NOT GO to Paris in August. Since the locals are gone, the places still open are totally expecting to deal with the traveling crowd. I remember from my times in Paris before that in many shops and restaurants workers were just not willing to speak English with me. 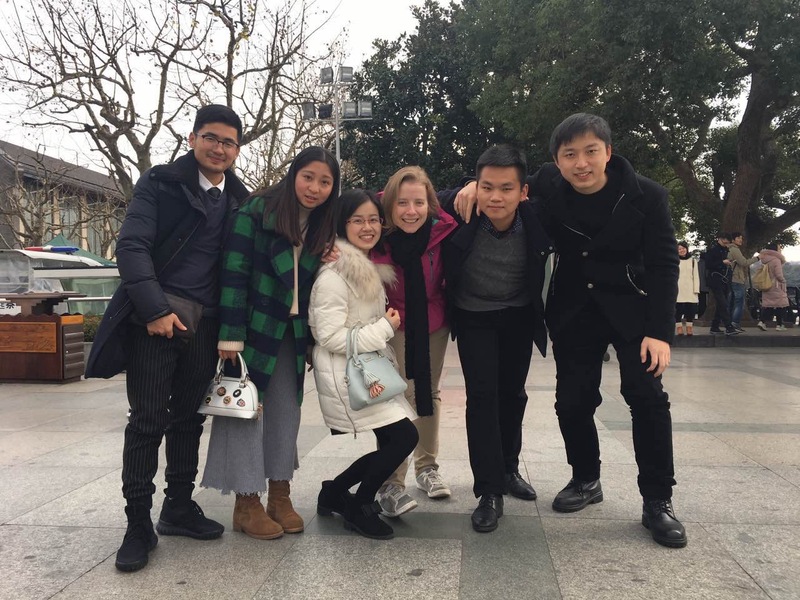 This time everyone spoke English, and willingly, because they knew their clientele was more likely to be a traveler than a local. 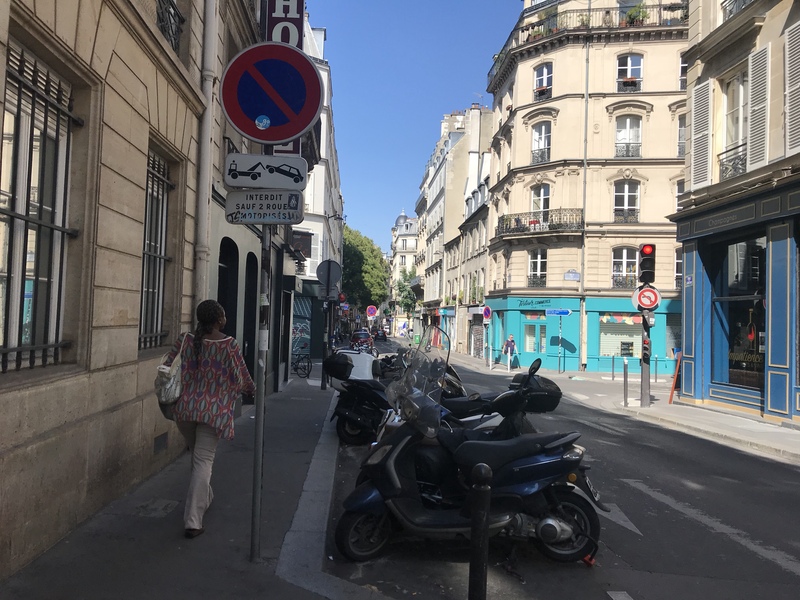 I really prepped for my trip, learning several phrases and brushing up my middle school French, but after a few days I realized it wasn’t necessary (besides bonjour and merci to be polite.) I spent a lot of time in cafes and small, seemingly non touristy places and yet the waiters were speaking English, German and Spanish. The waiters would ask “French or English?” when offering a menu. No local people means no rush hour and it is very obvious. At times it felt almost apocalyptic with the giant 4 lane roads outside the Louvre and downtown areas totally empty in the middle of the day. I met my friend who had a car and we found parking in mere seconds. Walking in the middle of the street was an option many times just because there was no car traffic. The gardens are all blooming, the fountains are filled with water and the city, knowing full well it is high tourist season, puts on its best display. 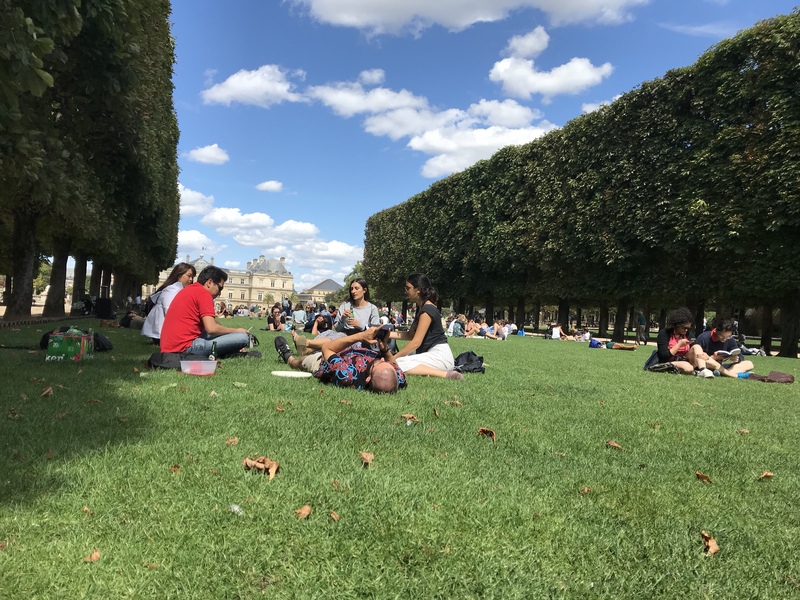 So you can spend the days lying on the grass at Luxembourg Gardens, or taking a cat nap on the lawn outside the Louvre. You can take great pictures and bubbling fountains because they are all filled with water and turned on. And you have so much sunlight. The sun rises at 7 am and sets at 9 pm. And don’t forget the cafes. The streets are filled with cafe seats overtaking the sidewalks as patrons try to take advantage of the weather while they can. I only had one meal inside a restaurant (because it was a fancy place with no outdoor seating) and all the rest I was able to sit on the sidewalk with excellent people watching. The well manicured gardens were in full bloom in August. In August the city has many special events including turning part of the banks of the Seine into makeshift beaches and having free outdoor movies. Also, buskers, musicians and performers are out and about trying to earn money from the tourists. I ate ice cream while listening to a Spanish guitarist, watched some roller blades doing tricks to 20’s jazz music and almost every bridge and subway had a lone accordionist adding that very French mood. The subway and streets were filled with people in orange and green vests there solely for the help of tourist. Bilingual and armed with maps they stood in the ticket areas of the subway (or on the tracks) and helped anyone that looked confused. Based on their locations (always in the tourist spots) and the fact that my local friend said she had never seen them before, leads me to believe this is a special feature of the city for summertime only. Clearly visible they stood at subway exits and sometimes even at the subway tracks to help lost tourists. Here’s the thing. August isn’t hot. The heat waves usually come in July, and by August there is even a little nip of fall in the air. And the days it is hot, a few days in early August were 35 degrees when I was there, it isn’t that bad. There is no humidity and the nights are quite cool, requiring a light sweater. I am very sensitive to heat (I can’t sleep if I sweat even a little) and was nervous about no air conditioning. But it was not at all a problem. An open window and a fan was more than enough to make me reach for the covers because I was too chilly! Nothing like lazing on the grass on a warm summers day. For the most part, places listed in your guidebook will be open. I wanted to go to candy shops, art stores and bookshops and they were all open. Ditto with the many cafes and bistros I wanted to go to. Because these places KNOW they are in guidebooks and they make a lot of money off tourists in the summer, they make sure to stay open. While many shops were indeed closed, and perhaps I missed out on a great taco place and coffee shops, I was never at a loss to find amazing food. Tourists are a problem. 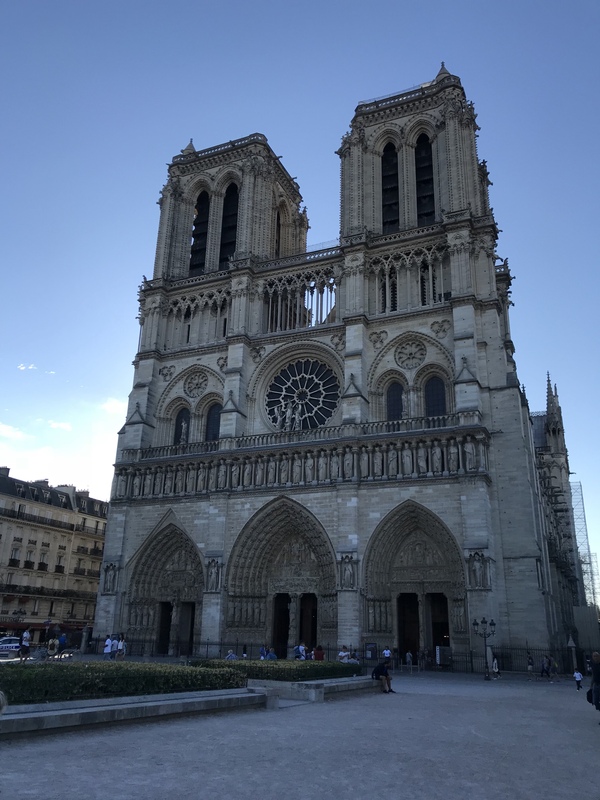 While walking around parks and shopping streets was fun because of all the people, trying to get into Notre Dame with a line down the block was less fun. But there is a work around. Tourists are lazy and Paris is a late starting city. That is, at 7am I couldn’t find a cafe open to eat breakfast but at 11:30 am everyone was just rolling out and eating breakfast. So all you have to do is get to places early. I went to Notre Dame 8:30 am (thirty minutes after they opened) and was met with no line and and almost empty church. I walked by later in the afternoon and the line stretched down the courtyard. Notre Dame at 8:30am in August! No I didn’t frame the shot special to avoid the people. There really was no one around. Despite it being the busy tourist season I had the place almost to myself. So I did that with every museum and tourist place, arriving close to opening time, and it was fine. No lines, no crowds. The only museum this didn’t work for was the Louvre. I tried going at opening and the line stretched hundreds of feet down the corridor. But the Louvre has night openings, so I went in the early evening and had zero line to get in and a 2 minute line to buy tickets. So museums = early (except the Louvre = late). My daily plan was do a museum/tourist place in the morning, then spend the afternoons in parks and cafes where more people made for more interesting people watching. So if you are going to Paris in August and are worried you are making a horrible mistake, don’t worry. If you are just a normal tourist going to Paris for fun and adventure August is a great time to go, perhaps even the best time. Yes, many restaurants were closed, but this is PARIS. Amazing food was always available in abundance.